A network of maintained trails provide access to dramatic vistas, lush old- growth conifer forests, meadows of wildflowers and waterfalls. Friends of the Columbia River Gorge has a 2015 brochure listing hiking events. Some six different bus companies serve the Columbia Gorge. The Columbia Gorge Express connects Portland’s Gateway Transit Center to Multnomah Falls and Hood River. The Pacific Northwest Forests app will help find hiking trails, camping, picnicking, boating areas and more. Loop the Washington Gorge and mountains by car. Total drive time: 4+ hours. Along 141 is a 650-foot ice cave with ice year-round. Close by is Natural Bridges, a couple of partially collapsed lava tubes that created natural archways. The area gets beautiful fall color. Heading south on Forest Road 65, back toward the Columbia River, stop at Panther Creek Falls. 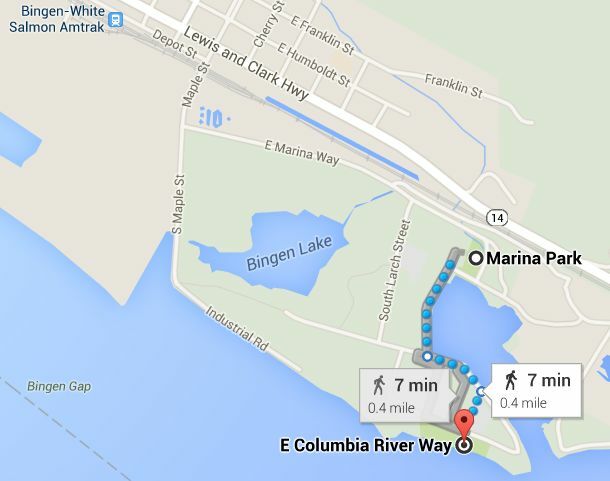 A 0.4-mile walk will take you to a viewing platform and back to the parking lot. An option for a longer hike is Falls Creek Falls, a 4.4-mile out-and-back hike that traverses the forest and a cable suspension bridge overlooking the white water of Falls Creek. The trail ends at the waterfall. Dog Mountain is one of the most popular trails on the Washington side of the Columbia River Gorge (Columbian). The 6-mile trail splits into two forks that meet again at the summit. A lookout was built in 1931 and reconstructed in 1952 to watch for fires across the river in Oregon’s Mount Hood National Forest. Franz Lake National Wildlife Refuge. Beacon Rock State Park; $10 day pass or $30 annual Washington State Park pass. Columbia Gorge Interpretive Center; 9 a.m. to 5 p.m. daily; 990 S.W. Rock Creek Drive, Stevenson; $10 adults, $6 children, $8 seniors and students; 509-427-8211. Dog Mountain; the prime wildflower viewing is May and June; $5 day pass, Interagency Pass or Northwest Forest Pass. Ice cave; $5 day pass, Interagency Pass or Northwest Forest Pass. Carson Hot Springs, 9 a.m. to 8 p.m. daily; 372 St. Martin’s Springs Road, Carson; costs vary; 509-427-8296. Pick up the free Motor Vehicle Use Map — which shows seasonal forest road closures — available at the Fort Vancouver National Historic Site Visitor Center. The $30 Northwest Forest Pass is an annual pass honored at all Forest Service day-use or entrance fee sites in Washington and Oregon. A $5 day pass is also available. The $80 Interagency Annual Pass waives most day use fees and most entrance fees managed by federal agencies. The Columbia Gorge Express bus is an affordable and convenient option for traveling between Portland and the Columbia River Gorge National Scenic Area. Daily service begins June 11, 2018. Leave Portland’s Gateway transit center at 8:30am and arrive in Hood River at 9:47am. Leave Hood River at 3:30pm and arrive back at Gateway at 4:55pm. $15 round trip. The Columbia Gorge Historic Trail, designated for hiking and biking, will eventually extend from Cascade Locks, through Hood River and terminate at The Dalles (Bike Maps). Currently you can bike from Troutdale to Cascade Locks using a combination of the Historic Highway and the bike trail that goes from John Yeon State Park to Cascade Locks (map). The Mark O. Hatfield section of trail, just east of Hood River, is now complete. This bikeable route goes from Hood River to Mosier, then continues on the existing historic highway. It travels past the spectacular Rowena Overlook, and on to The Dalles, the official terminus of the Historic Highway. The yellow line in the above map indicates traveling generally restricted to the I-84 freeway. This year’s trail work, reports Terry Richard, is a 1.2-mile connection from Starvation Creek near milepost 55, to Lindsey Creek, near Viento State Park. It’s due for completion in 2016. That still leaves a proposed five-mile, $32 million project on both sides of Mitchell Point, between Cascade Locks and Hood River. It’s tricky because the Mitchell Point tunnel, the one with the 5 “windows”, was completely removed by dynamiting to make way for I-84. Only a sheer cliff remains. Funding is still needed for that project. To summarize, biking routes are now available between Troutdale and Cascade Locks and between Hood River and The Dalles, but work remains “reopening” the route between Cascade Locks/Wyeth to Hood River. The advantage of the Trekker Streetview camera is that the entire hike can be captured, much like Google’s Streeview records a continuous journey. Excellent hiking guides are available at The Outdoor Project, Friends of the Gorge, Curious Gorge, Oregon Hikers, Portland Hikers, Washington State Parks, Oregon State Parks, US Forest Service Parks and the Forest Service Day Hiking Guide. Here are 9 more difficult trails in The Gorge. Terry Richards, of the Oregonian, compiled his top 10 trails in Columbia River Gorge for spring and summer hiking. He also lists the five best hikes on the Washington side and the 10 best hikes in the Gorge for wildflowers. According to Portland Hikers Fieldguide some of the best hikes include Latourell Falls, Angel’s Rest, Wahkeena Falls, /Multnomah Falls, Triple Falls,Ponytail Falls and Elowah Falls. Day Hiking Trails and Backpacking Trails include Gorge Trail #400, a 35 mile trail along the Gorge and Trail number 438, which starts at Horsetail Falls and winds around to Ponytail, Oneonta, and Triple falls. Trail 415 (4.8 miles) leads up to Angel’s Rest, #420 (2.8 miles) passes by an historic stone arch bridge, Wahkeena Falls and Fairy Falls, while #441 (6.8 miles), the Larch Mountain Trailhead will take you up to Sherrard Point, from which can be seen Mt. Rainier, Mt. St. Helens, Mt. Adams, Mt. Hood and Mt. Jefferson. The Forest Service Day Hiking Guide and the Gorge Bike Map have more details. Trails also provide insight on the area’s geology. About 15,000 years ago and near the end of the last Ice Age, a gigantic flood swept down the river corridor and scoured cliffs. The massive wall of water, estimated to have been 1,200 feet tall, left tributary streams hanging high over the river and produced one of the world’s greatest concentrations of waterfalls. Friends of the Gorge has summary of Hikes in Oregon and Washington. Here are some of the easy to moderate hikes. 2. Horse Thief Falls. Friends of the Columbia Gorge offers a guided tour of the petroglyphs every spring and fall. 4. The Klickitat Trail is a rugged 31-mile biking and hiking path following an old railroad bed links the towns of Lyle and Warwick, Wash.
7. White Salmon River Trails. The Coyote Wall Loop Trail is a difficult 5.8 mile loop trail located near White Salmon that features a waterfall. The trail is rated as difficult and primarily used for hiking. Parks in the Columbia River Gorge include Oregon State Parks, US Forest Service Parks, and Washington State Parks. Here are some Accessible Adventures in the Columbia River Gorge.